Wrapping up a two-day orbital chase, a Russian Soyuz spacecraft carrying two cosmonauts and a NASA astronaut glided to a smooth docking with the International Space Station Thursday, boosting the lab's crew back to six. With commander Oleg Novitskiy, flight engineer Evgeny Tarelkin and shuttle veteran Kevin Ford monitoring the automated approach from the Soyuz TMA-06M descent module, the compact spacecraft's docking system engaged its counterpart at the end of the Russian Poisk module at 8:29 a.m. EDT (GMT-4) as the station sailed 250 miles above southern Ukraine. "Docking confirmed, contact and capture confirmed," said NASA mission control commentator Rob Navias. 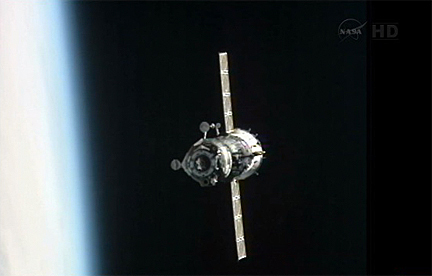 "A flawless approach, a flawless docking for the Soyuz TMA-06M." 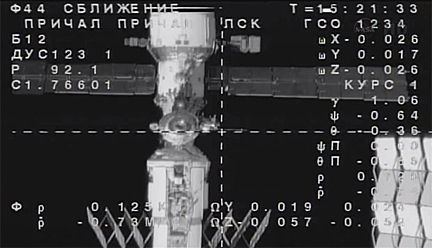 Hooks and latches then engaged, pulling the Soyuz snugly into place. After extensive leak checks to verify a tight seal, hatches were opened and the station's crew -- Expedition 33 commander Sunita Williams, Japanese astronaut Akihiko Hoshide and cosmonaut Yuri Malenchenko -- welcomed their new crewmates aboard. During a chat with mission managers and family members at the Russian mission control center near Moscow, the new crew members said they were feeling good and looking forward to getting down to work. "It was just an incredible ride, very similar to, the Gs and stuff, on a shuttle," Ford told his family. "But lots of different noises and vibrations and feelings. It was a fantastic trip. ... It really went fast for me. The two days went really quickly." Speaking to his daughter, Heidi, Ford praised his Russian crewmates, saying "Oleg and Evgeny flew that spacecraft like they'd flown it five times before. It ... couldn't have gone smoother." "Did they save you any ice cream?" Heidi asked, referring to ice cream that was sent up to the station in a freezer aboard a commercial cargo ship. "They're saying 'maybe,'" Ford joked. "Of course, we have some things for them, too. So if we don't see the ice cream, we might not hand over their goods." One of the first items on the crew's agenda was to transfer 32 Asian medaka fish from the Soyuz to a high-tech aquarium in the Japanese Kibo lab module for research on how space radiation and the absence of gravity affects growth and development. Novitskiy reported "the fish are still alive" and that "Aki's already checked on them." Novitskiy, Tarelkin, Ford and their aquatic passengers were launched from the Baikonur Cosmodrome in Kazakhstan on Tuesday. The two cosmonauts are making their first space flights while Ford piloted a space shuttle during a 2009 space station visit. All three plan to spend 143 days in space before returning to Earth in mid March. The new crew members face an unusually busy first week aboard the station. On Sunday, Williams and Hoshide will use the station's robot arm to unberth the commercially developed Dragon cargo ship from the forward Harmony module, releasing it into open space for a fiery plunge back to Earth and a splashdown off the coast of California. The Dragon cargo capsule, built, launched and operated by Space Exploration Technologies -- SpaceX -- as part of a $1.6 billion commercial resupply contract, will bring about a ton of equipment, experiment samples and other gear back to waiting scientists and engineers, restoring a capability that was lost with the shuttle's retirement last year. Three days after Dragon's departure, the unmanned Progress M-17M supply ship is scheduled for launch from the Baikonur Cosmodrome. Flying a single-day rendezvous, the spacecraft is scheduled to dock at the Zvezda module's aft port around 9:40 a.m. that morning. 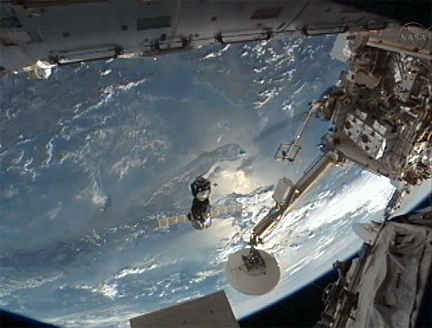 Its cargo includes 2,050 pounds of propellant, 926 pounds of water and 2,738 pounds of spare parts and other equipment. The day after the Progress launch, on Nov. 1, Williams and Hoshide plan to carry out a complex six-and-a-half-hour spacewalk to bypass an ammonia leak in the coolant system of the station's far left-side set of solar arrays. The system circulates ammonia through a large radiator to dissipate heat, and if the leak isn't resolved soon, the station could lose one of its power channels. As it turns out, the port-six set of solar arrays includes spare radiators that were used during the early stages of station construction. Williams and Hoshide plan to install jumpers that will route ammonia to one of the currently stowed spare radiators, bypassing components that may be responsible for the leak. The radiator then will be redeployed to restore normal cooling. Williams, Hoshide and Malenchenko plan to return to Earth aboard the Soyuz TMA-05M spacecraft on Nov. 12, closing out Expedition 33. Ford, Novitskiy and Tarelkin then will form the nucleus of the Expedition 34 crew, with Ford taking over as commander. "We hope to have a little bit of (Christmas) festivities on board," Ford said in a NASA interview. "I’ve tried to plan ahead to have some things up there to make it seem like the holidays, and when New Year’s rolls around I’m going to do my best to be well rested and try to see some fireworks as we pass through those midnight time zones around the planet and see if we can pick up any of that from space."